STELLAR SALES: Like the little engine that could, Margaret keeps on selling. She came out of the gate strong with her first twos books, Killing Trail and Stalking Ground, and has seen sales grow for Book 3 in the series, Hunting Hour. We expect this fourth book to continue this great performance. K-9 COP: Mattie and her canine partner Robo are sure to win the hearts of mystery lovers and animal lovers alike. Margaret's experience assisting with her husband's animal clinic gives her the animal-loving background to make her canine protagonist work. MOUNTAIN MYSTERY: The woodsy Colorado setting will appeal to fans of C. J. Box and Nevada Barr. TOUGH AS NAILS HEROINE: Mattie is a fresh, rough-and-tumble kind of heroine, with a soft heart underneath it all. Readers won't be able to resist. So far, this is the most interesting, suspensefull, and heart-warming of the Timber Creek K-9 mystery series. Mattie has had a lot of sorrow in her life, but finding her brother and then his dying before she can actually meet him in person is heartbreaking. I dearly love Robo and his relationship with Mattie, plus I love the manner in which he excels as a search and rescue dog, as well as his canine intelligence--he was able to identify a culprit in a lineup. I am looking for more Timber Creek K-9 Mystery books. I recommend them highly. 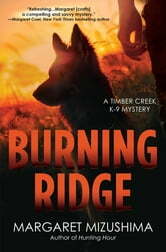 Burning Ridge is the latest book in the Timber Creek K-9 mysteries by Margaret Mizushima. Burning Ridge is a stand alone story, in which Ms Mizushima makes it quite easy to understand the background relationships. Our heroine, Mattie Cobb, feels like a friend and the reader can't help but wish Robo, her German Shepherd, belonged to us! I was given an early copy to review. A nice blend of action, suspense, and mystery! Burning Ridge is the fourth book in the Timber Creek K-9 Mystery series and even though I had not previously read a book in this series, I was able to follow along quite well. The Author provides enough backstory information that I never felt lost but not so much information that I would be turned off from wanting to read the first three books. In this story, Mattie and Robo uncover some ghastly remains which hit closer to home than Mattie could have ever considered. I was horrified and heartbroken for Mattie because I couldn’t even begin to comprehend what the truth of her discovery must have felt like and with a deranged killer on the loose, just yikes! The mystery element was chilling and full of suspense. I enjoyed how the story had its sweet moments, clinical moments, and terrifying moments. It was never dull and kept me fully engaged throughout. I thought the relationship between Mattie and Robo was quite realistic and that there was never a moment where Robo was given any abilities beyond what a real dog could do. I just loved their partnership and thought that Robo was a great character who brought some comedic relief in addition to being an all hands-on deck type of character. He really gave everything his all. There is a romance element between Mattie and Cole which was established in the previous books. In this book, Cole and Mattie have been in a good but undefined place prior to the drama that unfolded. With all that had taken place, Cole was afraid that Mattie was going to pull away again and Mattie just doesn’t even know what to think. The idea of a relationship was hard for her and in her experience usually only brought pain. It was nice to see her work through her issues and Cole was truly just a great guy! Overall, Burning Ridge was a great read with a nice blend of action, suspense, and mystery! This review is based on a complimentary book I received from NetGalley. It is an honest and voluntary review. The complimentary receipt of it in no way affected my review or rating. Detectives with dogs on the hunt for answers is a favorite story line for me. Retired military MP Mercy and her dog Elvis search for answers when they discover a abandoned baby in the woods. But.. when the baby disappears from the hospital these two do not rest until she is found. With the help of the U.S. Game Warden Troy Warner it is danger behind every corner. "A copy of this book was provided by St. Martin's Press via Netgally with no requirements for a review. Comments here are my honest opinion." Look forward to more in this series. I know when I thoroughly enjoy a book when I lose track of how much I have left to read. This book has what I am looking for- a good plot and good characterization to keep my interest. I have read all the books in this series and intend to read any new ones by this author.